Logitech K400 vs K400+ | Life, The Universe and ... Everything! 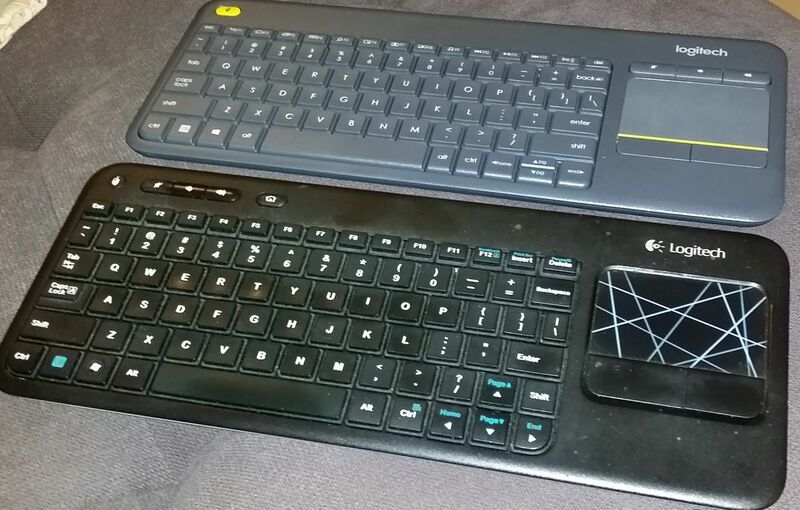 Back in 2011, I purchased the Logitech K400 keyboard for my living room PC, which is connected to the TV. I used this to watch Netflix and Youtube. The K400 is a fantastic keyboard for a media PC like this, as it combines a touchpad and a keyboard in a single lightweight unit. When you're lounging about on your sofa, the last thing you want is to have two peripherals to deal with, nor have to fumble to have a suitable surface to run a mouse on. I've found this keyboard so useful that I've been "borrowing" it whenever I need to use a keyboard or mouse with my Raspberry Pis. The Pis are so light and tiny that it's much more convenient to just plug in the tiny Logitech USB dongle, than use a wired keyboard. This has happened too often that it's started to bug me -- I'll settle down nicely in front of the TV to find the keyboard not there. So it was time to get another unit. I dropped by PJ Digital Mall only to discover that the model has been superseded by the Logitech K400+, at RM159 (I paid RM129 for the K400 six years ago). There was a similar Microsoft keyboard for RM149, but old grudges die hard, so I plonked the extra RM10 and went with the more familiar Logitech K400+. To begin with these are not full sized keyboards meant for large amounts of typing. They're about 85% smaller than a full sized keyboard, and don't have as much travel or "feel" as a full sized proper keyboard (I'm judging this by IBM Model M standards, which I consider a "real" keyboard. Compared to some of the really cheap nasty keyboards out there these aren't too bad). So what has Logitech gone and done? Well there's a bright yellow stripe and button on it now. I guess they decided to change the case from black to gray, and then needed a colour that contrasts well with grey, so ended up with yellow. It'll look jarring in most living rooms, but that's a minor issue for me. The mouse buttons are now of equal size. As a left hander, I appreciate non-biased mouse buttons, but if you're putting the touchpad on the right hand side you've pretty much decided things for me. In which case, having one button bigger at least made it clear which one was the primary button. Now? The volume keys have been moved to the top of the touchpad. I've not gotten used to it yet but I think this is a better position. While both are made from similar quality plastic, the K400+ has a sharp edge along it's seam. It's not sharp enough to cut you, but irritating when your hands brush over them. The top most row now defaults to "media" keys; if you want to use the F1-F12 you have to hold down the FN key together with it. I find it strange that this actually makes sense to me. They've made the right shift key full size, but now we have half sized up and down keys. I'm not using this to edit code, so it's probably an acceptable compromise. The battery compartment flap on the back is loose on my unit. If you touch it, it rattles. Nothing unfixable with some paper or tape jammed at the right spots. Conclusion: A bit more "meh" than the original. If you're looking for a decent media pc keyboard, while the K400+ is still a strong contender, check out the Microsoft one as well at RM10 less.